OpenText Exstream consists of three main tools: Composition Center, StoryTeller, and Design Center. A fourth tool, Ad Hoc, provides document-editing capabilities as an add-on to an existing browser-based tool. 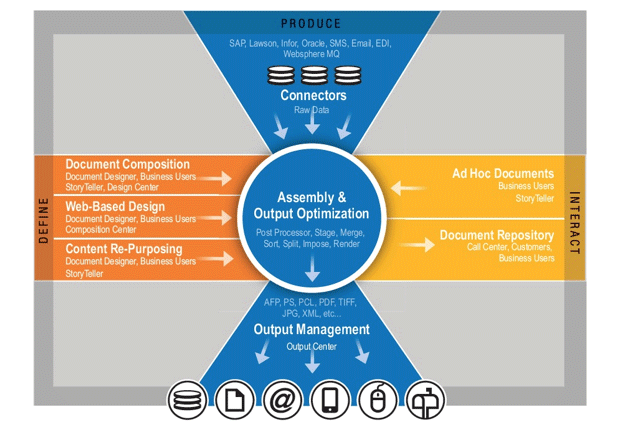 The use cases for the different Exstream tools hinge on the role and function of the business user in the design, processing, and output management of the document. StoryTeller is intended to be used by designers for the creation of document design templates that can be manipulated by business users in order to meet the specific requirements of a promotional campaign, or other communications activity. Design Center provides a more comprehensive processing and output management environment for data and output management, while Composition Manager is used by business users in marketing, legal, billing, and other departments to create and manage the content in the documents and other communications. The focus on establishing sustainable business practices and reducing environmental footprints continues to intensify. Frequently, this is seen as a zero-sum effort where business suffers in order to take better care of the planet. But in fact, some of the same steps that help sustain the health of the planet also sustain and improve the health of the enterprise. Document-based business communications is a case in point. Since 1997, Exstream customers have improved profitability through reduced operational costs and increased revenue-generating capabilities, while at the same time significantly lowering their environmental impact. 1 Migrate from paper to electronic documents. Electronic communication eliminates many direct and indirect costs and the environmental impact associated with paperbased communications. Exstream enables you to smoothly and selectively migrate to electronic communications as, and where, it makes the most sense for you. 2 Reduce remaining paper-based costs. Two-sided printing alone can cut carbon/energy impact and other costs by up to 50%. For customer correspondence, such as billing, replacing inserts with “onsert” marketing and other information printed directly on the bill cuts paper volume and associated production, handling and delivery costs. Exstream enables these and numerous other ways to trim the cost of paper-based communications. Almost every document-dependent process offers numerous opportunities for greater efficiency and reduced resource demand. For example, compressing supply-chain processes and volume document production through electronic stage-and-release and pre-processing conserves energy, improves accuracy and cuts costs. 4 Reduce IT infrastructure demands. The rising costs of equipment and energy underscore the value of minimizing IT infrastructure. Consider document storage as just one example. Exstream optionally archives only the essential data associated with a document, and, from templates, reconstructs the full document on-the-fly, as needed. This substantially reduces the amount of storage needed: Fewer resources, lower energy costs, better environmental profile. 5 Personalize the motivation to change. Exstream uses a master template to individually assemble documents such as customer bills. This means that even at very high volumes, each bill can carry personally relevant offers or suggestions. So, for example, marketing campaigns to influence behavior—perhaps to encourage lower airconditioning use, or suggestions to conserve water—can be automatically personalized based on the each customer’s usage history. 6 Capitalize on what you already have. A basic environmental tenet is to get more use from, or extend the life of, resources that already exist. This includes business systems. Exstream integrates with any business systems and applications, and requires no change to those systems because the document processing happens independently of them. As a result, it provides extensive new enterprise capabilities in a simplified environment that can be rapidly implemented. It also significantly reduces the support demand on IT. 7 Solidify your standing with your extended community. Sustainability is in the public mind more than ever before. Companies that demonstrate the kinds of genuine results that Exstream enables enjoy greater customer loyalty as well as respect among peers, regulatory bodies, and others in their extended community. Though not as easily measured, this goodwill is essential to the sustainability of the business.